She's the Pilot of The Crew and an all around badass. This was the premise I had in mind for Aia... someone who was confident, adventurous, filled with positive energy... as well as captivating and appealing as a result. I wanted that appeal to come from within and build the design around that driven personality, of an unrestrained and comfortable-with-herself person. Okay, okay! So I might have romanticized her personality a bit... So what. I strongly believe that as a character designer, whether you're designing a likable character or a villain, you have to invest yourself emotionally with it, if it's going to result in a genuine and memorable character. Plus, I draw whatever I please, so beat it... Here she is and this is how she came to be! Enjoy! This last model is Devon Jade and I feel obliged to give her special credit, as I was greatly inspired by photographs of her more than any other's. 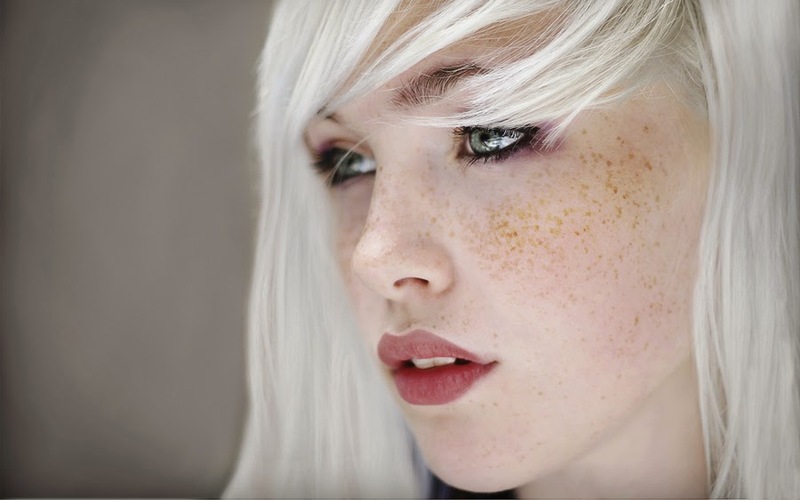 The striking white hair was a big part of it I'm sure, as this was a trait that I wanted to have in this character, even before I came across this particular model. Simultaneously, I was doing quick sketches and explorations to try to find the character. These type of sketches are also useful to receive feedback from the client and get a better idea of what they might like. Ever since I started collaborating with Animation Mentor, I've been working closely with the great Bobby Beck (CEO & co-Founder of Animation Mentor) and in this particular case, him and the team over at AM fell for #7 bellow. So, the sketches continued developing in that direction. 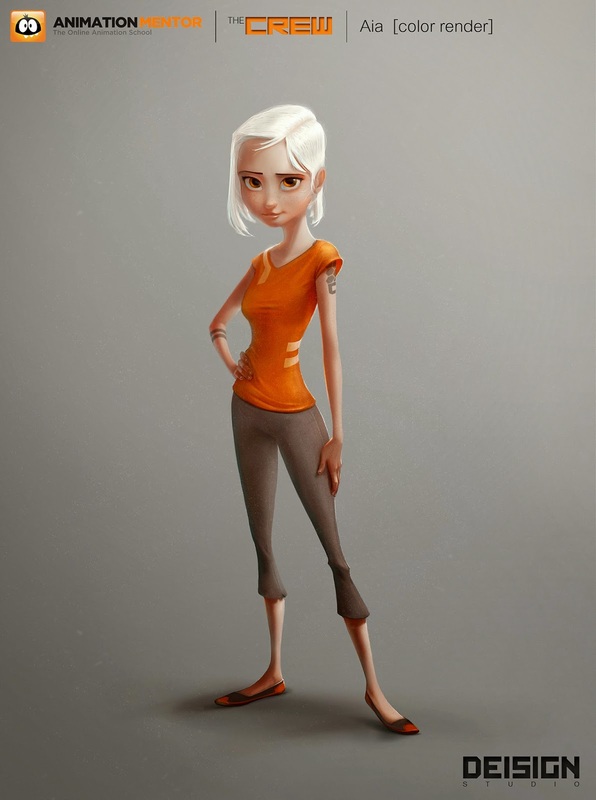 Fun fact... #2 was inspired by this rad looking cute girl I briefly came across at a bar in San Sebastian. I would have so loved to go with a hairstyle like that.You never know where inspiration will strike... sometimes it just "walks into a bar". Once the color render of the design was given the "final" stamp, we started working on the modeling of Aia. In order to give art direction on the modeling progress, I did some paint overs over initial sculpts by our modeler, before moving to poly-modeling. 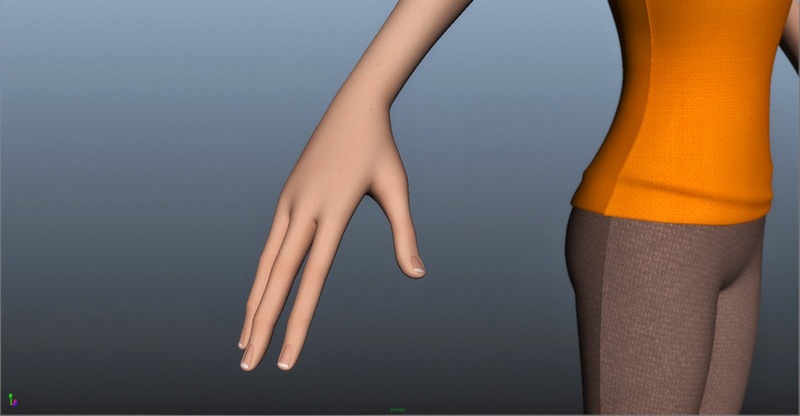 Working with stylized human characters is specially difficult, as everyone's eye is naturally trained and highly critical when looking at these types of designs. Appeal is a tricky thing. After numerous iterations and by the end, minuscule adjustments, we eventually came to Aia's final model, which was then ready to go into Rigging and Texturing. As you can see bellow, we put great attention to detail in all areas... subtlety is complex. At this point the process diverted into two simultaneous streams: Rigging and Texturing. For the former, I created an expression sheet for Aia with a collection of notes and objectives that I thought we really needed to nail. Luckily for us, we had the amazing Ozgur Aydogdu in charge of rigging, and well, as he usually does, he knocked it out of the park. 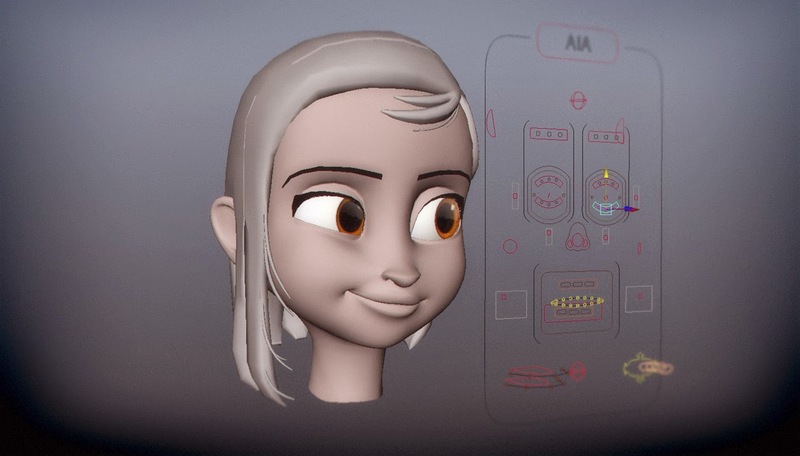 As a former character animator myself, when I first got my hands on the rig and was able to play with it... it amazed me how intuitive and easy was to get very rich and appealing expressions very quickly. I still want to create some poses and renders of my own... perhaps even an animation? 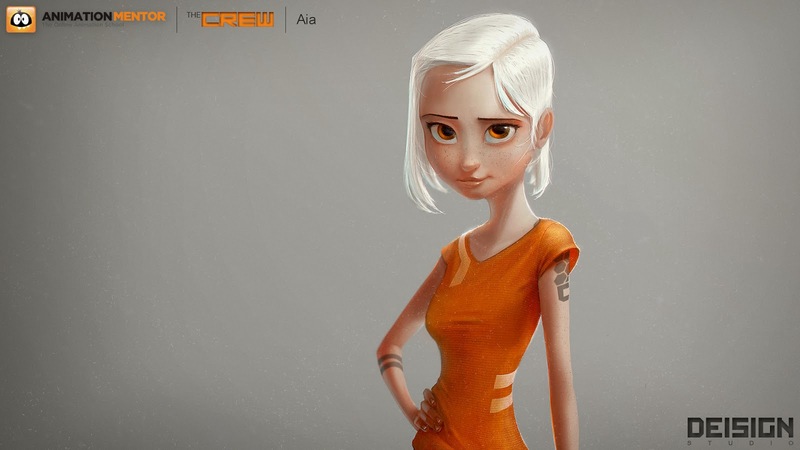 Pretty much simultaneously, I was working with Animation Mentors shader artist Rachel Ito, to develop Aia's look. Closely referencing my color rendered sketch of Aia, I was in charge of painting the color/diffuse maps that would then be applied by Rachel along with her shaders. Here are some viewport snapshots, just displayng the basic color maps with no lighting or shaders yet. 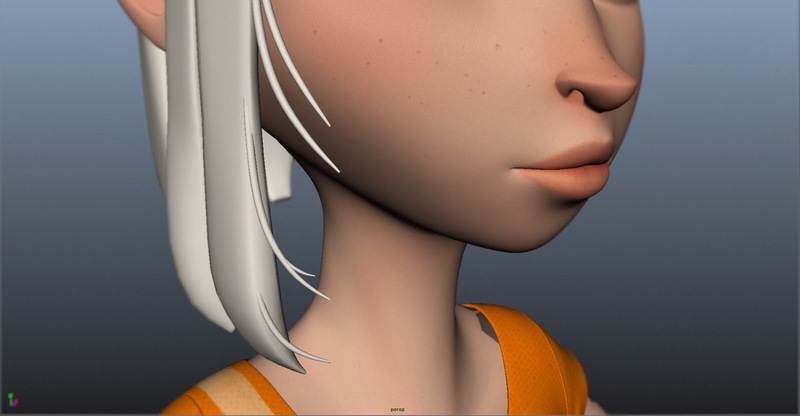 At some point during the rigging process, once we started seeing some animation tests by the amazing Lluis Llobera, we came to the realization that even though the standard hair was working and looking great, it was perhaps too big of a leap forward for beginner animators coming from the TRIBE characters. So, while we definitely wanted to keep Aia's standard hair, we determined it'd be wise to add an optional alternate hairstyle that would be shorter, with fewer controllers, and thus easier to animate. It was time to go looking for reference again and start sketching and exploring. And this basically brings us to now! There's an animation test coming up soon that I can't share with you just yet, but I'll update this post with it when it's out. If you have any questions about the design and creation process of Aia (that I might be able to answer), feel free to ask in the comments bellow! 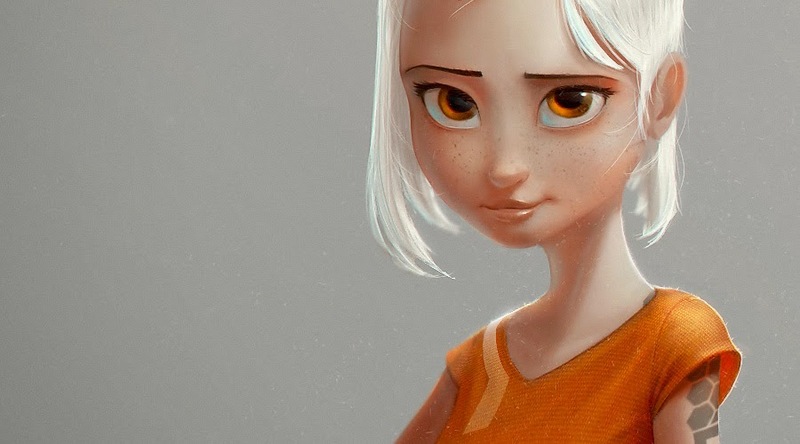 This is a awesome post, thanks for sharing your process! I really want to hone in on my drawing to describe in more detail what we want from our rigs at work. I love your sheet of notes, and it's very clear for the riggers to see. 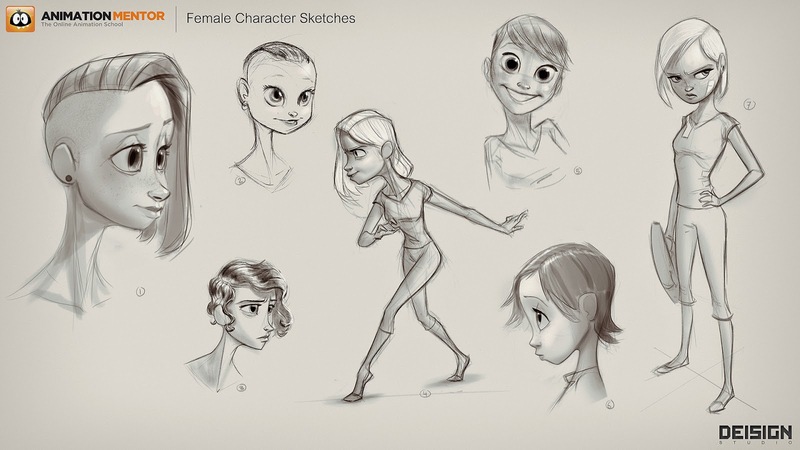 How do you find going from animation into character development? Thanks for your kind words! Glad you enjoyed the post! Yeah, I like to give detailed notes and drawings to try to ensure that the transition from the original design to final rig is as seamless as possible. Or if anything, that the character improves along the process. 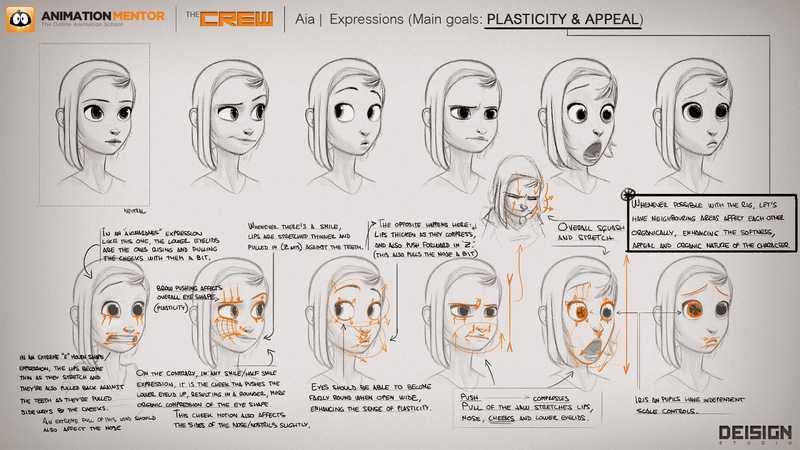 As for your question about going from animation into character development.. I find my background as a character animator helps me in a big way, to be aware of the needs the the character will ultimately have to fulfill. I feel that background has also improved my posing and expressions, as I always think of any sketch as being part of a scene or story... so that every expression and pose feels like it's coming from somewhere and going somewhere too; instead of just looking "cool" but void of personality. You are most welcome, India. Thank YOU for your support!! Thank you for the insanely speedy reply! Yeah that totally makes sense. 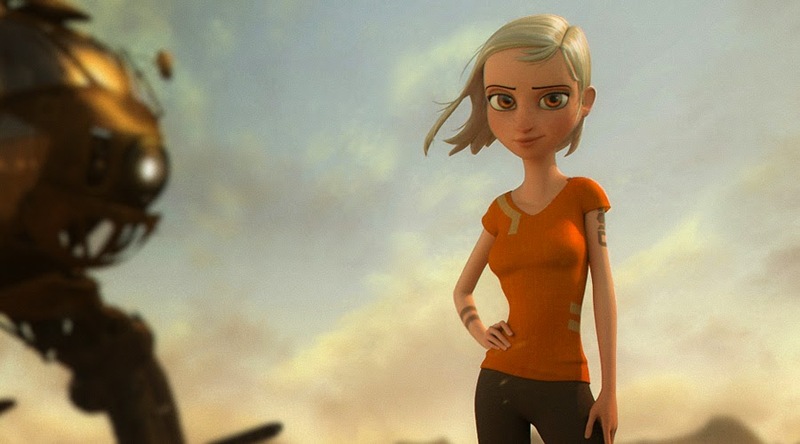 I'm currently working on my own short film, and the CG character is very geometric, and I want her to feel more like a 2D character. So trying to communicate the rigging choices is a little tricky, but this has helped a ton. My rigger won't know what's hit him! Ahh yeah, again, makes absolute sense. I love that idea of context, much more compelling then a t-pose turn around. Thank you again, so happy to have found your site! This is awesome man, what a masterlord of the 3d design galaxy! Great job. My congrats. 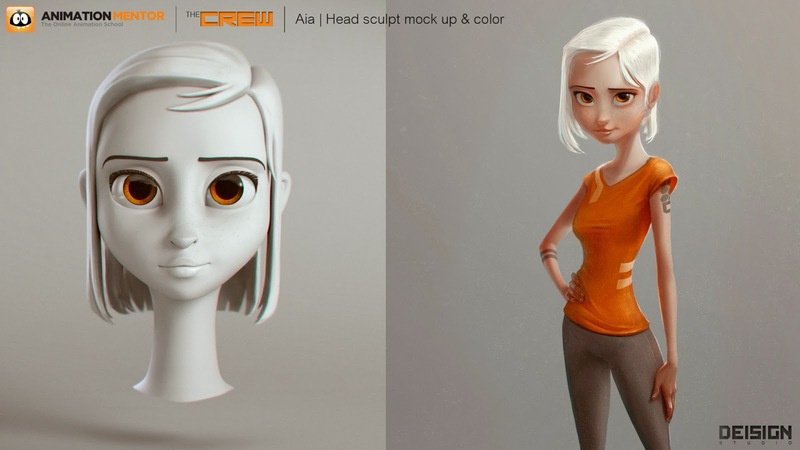 It would be lovely if you could post the process of making the hair geometry or at least a wireframe of the model. It's useful for studying the creation of the model. 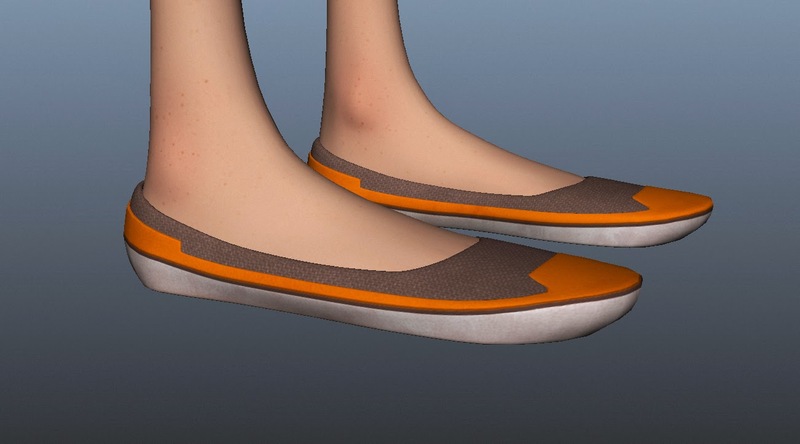 Hi this model looks fantastic and the breakdown is really helpful. 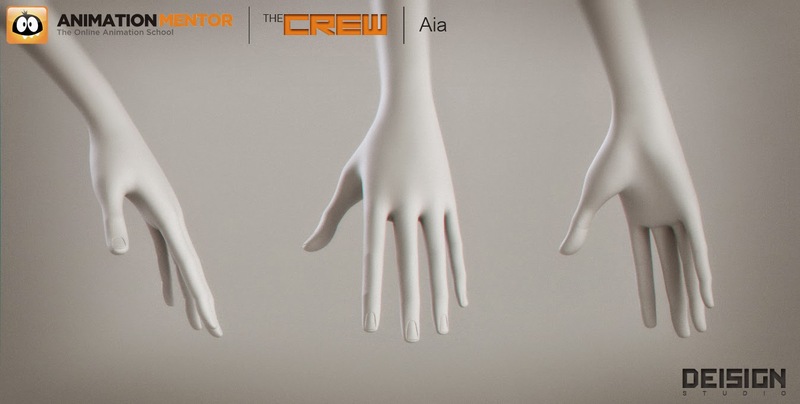 I'm studying game design and focusing on 3D Character creation and modelling so I was wondering what program you used to develop Aia? This is also the artistic style i'd like to go with my modelling and was wondering if you have any tips on how to get started with this style? Thanks, once again awesome work on this character!